Maid of Honor and Bride, May 1929. Butterick patterns 2360 (left) and 2634 (bride.) 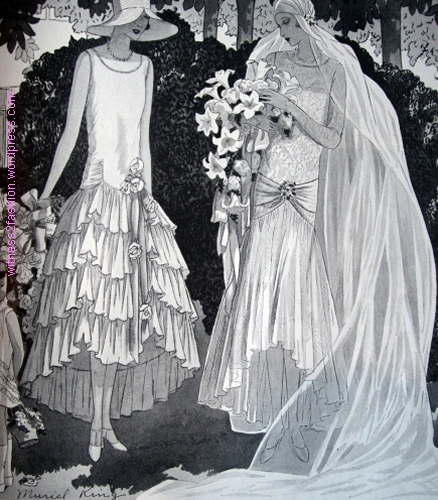 Illustrated by Muriel King. 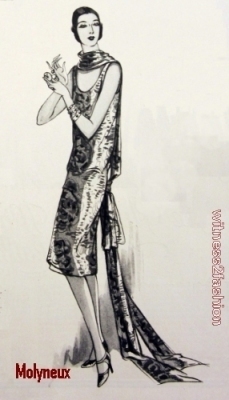 Miss Jean Ackerman wearing a gown by Paul Poiret in Ziegfeld’s production of “Whoopee.” Lucky Strike cigarette ad, March 1929. Delineator. 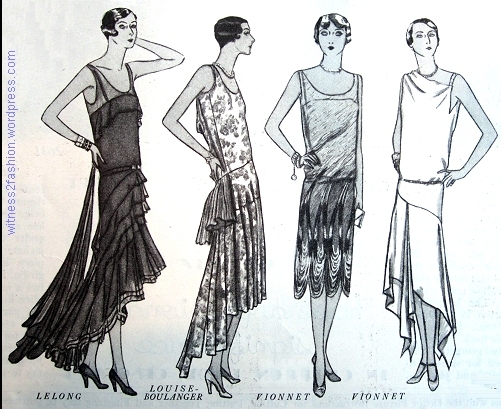 Poiret was no longer a leading couturier in 1929, but top designers like Lelong, Molyneux, Worth, and Cheruit were all showing what I’ll call High/Low hems. 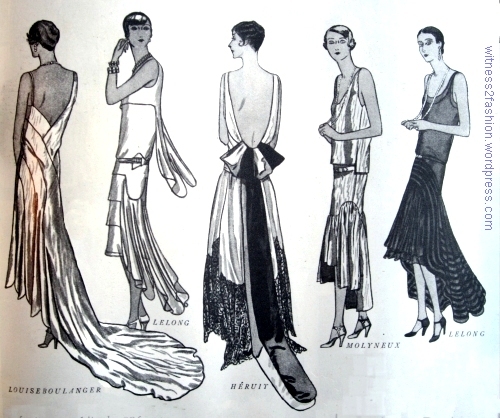 Couture evening gowns by (from left) Louiseboulanger, Lelong, Cheruit, Molyneux, and Lelong; sketched for Delineator, May 1929. 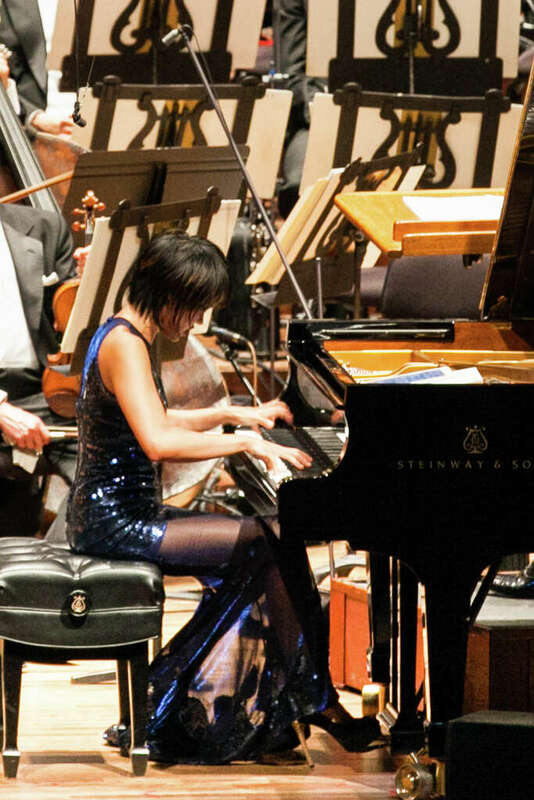 Couture from Lelong, Louiseboulanger, Vionnet, and Vionnet. 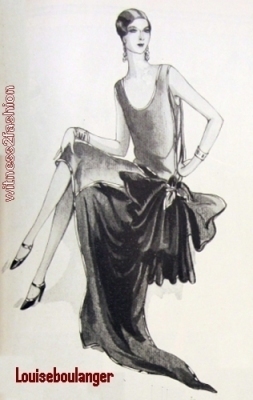 Sketched for Delineator, May 1929. 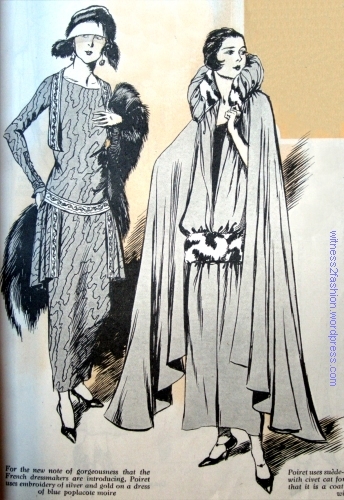 Couture gowns by Lucien Lelong, Illustrated in March and May, 1929. Delineator. I’ll link to some modern leg-baring dresses with sheer overlays later. 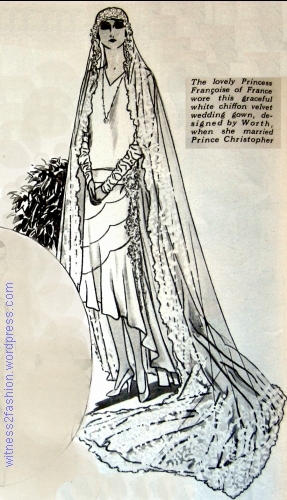 Worth designed this white velvet wedding gown for Princess Francoise of France in 1929. The gown is relatively simple so as not to detract from the yards of heirloom lace in her veil. Worth wedding gown designed for Princess Francoise of France. Sketched in Delineator, June 1929. Bridesmaid dress by Ardanse. “Green taffeta, with the yoke, tiny sleeves and skirt of tulle.” June 1929. 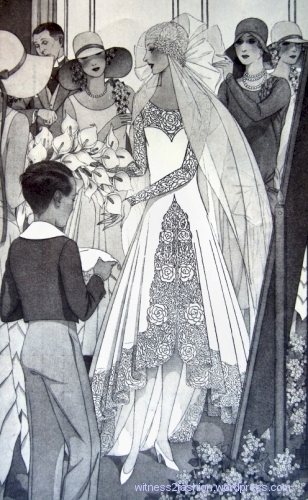 Wedding gown in Butterick’s Delineator; illustration for article, June 1929. Butterick pattern 2632 has a coordinating jacket. May, 1929. 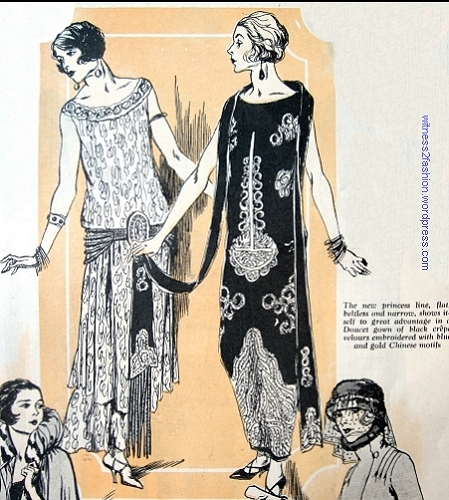 Butterick pattern 2634 dress and jacket; May 1929. We have now been living in a long period of varied hem lengths — without the edicts of other eras that “this season the hem will be nine inches above the floor” or “Just at the kneecap.” So how am I to explain the reappearance of high-in-front-low-in-back hems? An illustration — not by Soulie — from January 1924 Delineator. 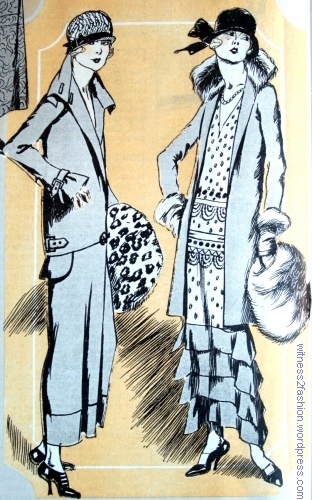 A coat (left) and a suit (right) by Jean Patou, January 1924. Sketches by Soulié for Delineator magazine. 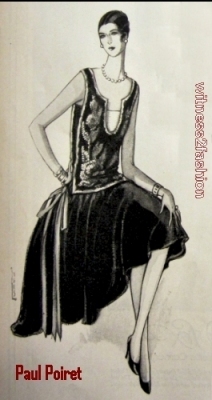 A suit and a dress designed by Agnès and sketched by Soulié for Delineator, Jan 1924. “Gold braid underscored with rose-colored embroidery binds the slashed edges of an overdress and tunic of black crêpe marocain. The foundation is narrow, the sleeve short, and the length about eight inches from the floor. From Agnès.” You can find out more about Agnès, and see one of her dresses, at 1stdibs. Click here. 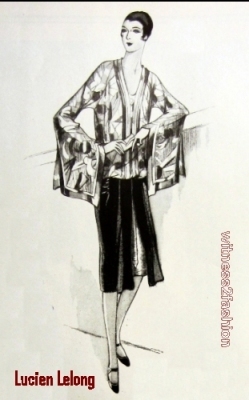 A dress with metallic threads and a cape-like coat by Paul Poiret, sketched by Soulié for Delineator, January 1924. 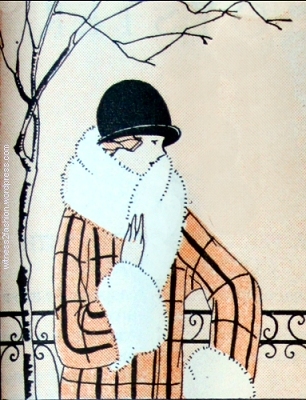 A coat and a dress from Louise Boulanger, sketched by Soulié for Delineator, January 1924. “The Ladies’ Book of 1924 is to show godets in skirts and capes according to an interesting coat of green wool duvetyn [a brushed woolen fabric] with a civet collar from Louise Boulanger.” You can see another 1920s dress by Louiseboulanger in the collection of the Metropolitan Museum. Click here. 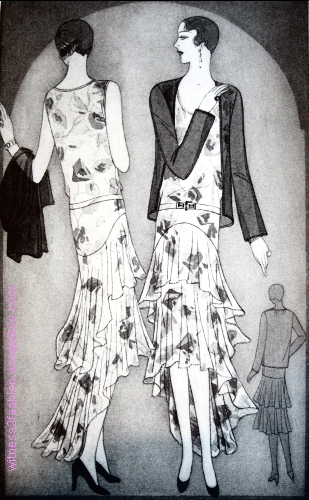 Two evening gowns by Doucet, sketched by Soulié for Delineator, January 1924. 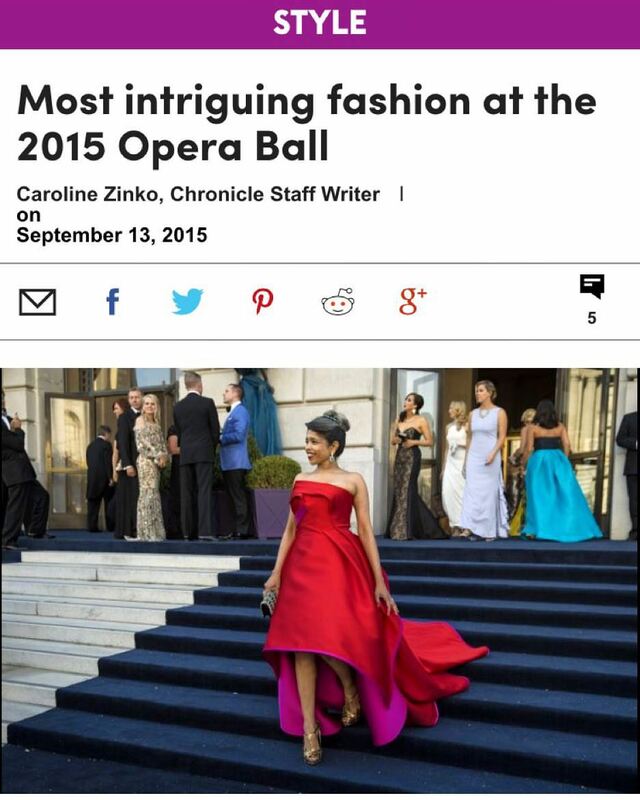 “Doucet’s characteristic elegance speaks for itself in an evening gown of steel lace over a blue silk slip. A girdle of blue chenille fringe is clasped with a motif of diamonds and blue stras. [Stras is a type of artifical jewel. 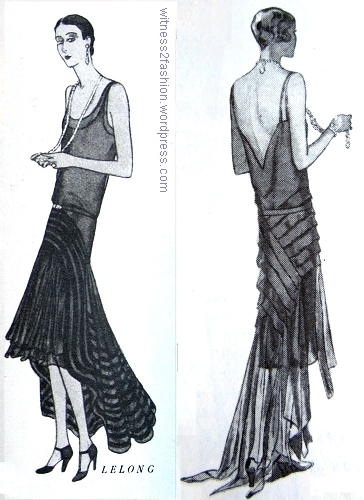 ]” The illustration shows the shoulder drape of the the black dress on the right hanging confusingly in front of the light-colored dress on the left — it does not have a black panel in front! You can read more about Jacques Doucet at Fashion Model Directory; click here. Skirts are still quite long — only 8 inches from the ground. All the models have short, “bobbed” hair. Most of these designs have strong accents at the hip; only the heavily embroidered Doucet gown is a tube. Fur adds a note of luxury to all the daytime fashions, either as collars, cuffs, belts, (even coat lining,) or carried as a stole or muff. Soulié has drawn most of the models wearing rather high heels, which means the skirts are very long to still be 8″ above the floor. 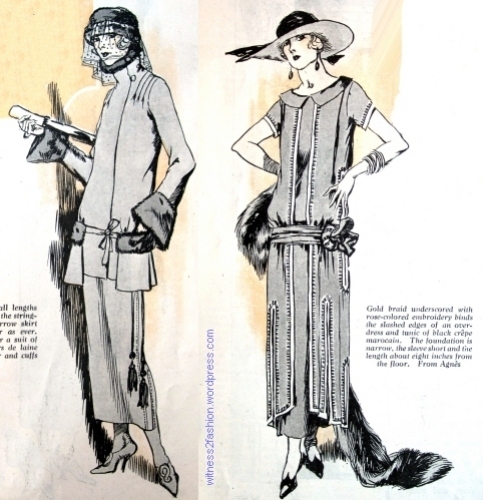 This is a two-page spread on the latest Paris Fashions of 1926. 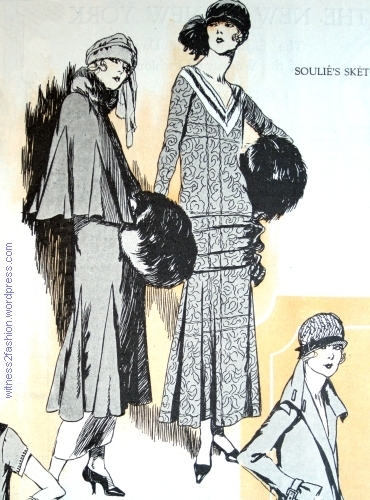 Coverage of the Couture collections was a regular feature in The Delineator in the 1920s; Butterick Publishing maintained an office in Paris, and used several sketch artists, including Soulié, who also worked for L’Art et la Mode. These illustrations are signed Lages. 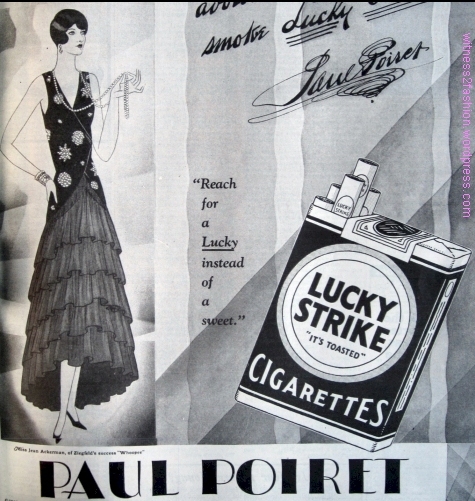 The designers featured in the article are Paul Poiret, Lucien Lelong, Louiseboulanger, and Molyneux. [Louiseboulanger is always written as one word.] 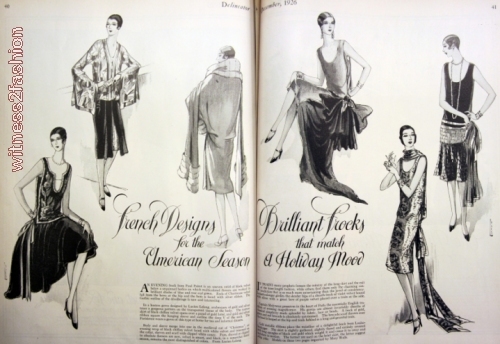 The gowns pictured on these two pages could be purchased in New York: “Models on these two pages imported by Mary Walls.” Mary Walls’ shop was located in the Waldorf-Astoria Hotel. 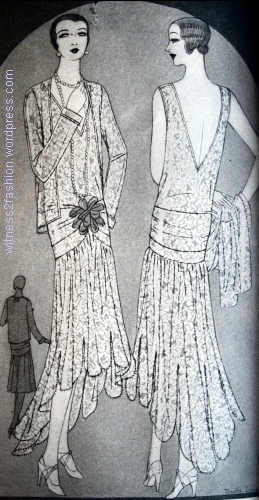 Some 1926 dresses had asymmetrical hems, longer on one side, or some trailing fabric that dipped below the normal hemline. The descriptions below show that some thought them a precursor of lower hemlines, but in fact. skirts got even shorter in the late 1920s, before descending to new lows, along with the stock market, after 1929.